“How Has Think Tank Transparency Evolved in 2018” highlighted 92 think tanks that were either broadly or highly transparent. Since the report was published, three additional think tanks have been rated as either broadly or highly transparent, bringing the total to 95. Reactor and the Center for Economic Analysis, both Macedonian institutions, reached out to us following the report’s publication to highlight their transparency. After Transparify reviewed their online financial disclosures, both were rated as highly transparent (five stars). In addition, the Elcano Royal Institute, which had never previously been rated, got in touch to highlight their transparency. After reviewing their website, we are happy to announce that they were rated as broadly transparent (four stars). The more think-tanks seek to extend the scope of their influence beyond elites in an era of politically awakened societies, the more they will need to be transparent about their funding sources and ensure appropriate forms of governance consistent with their missions. Similarly, the Guardian published a prominent editorial, arguing that think tanks must come clean with regards to their funding, linking to one of the assessments we have done. A few other pieces that referred to Transparify’s work recently include Politico EU and the Brussels Talking Blog; Open Democracy, True Publica and Unearthed/Greenpeace (UK); the Washingtonian (US); the Sydney Morning Herald (Australia); La Celosia & New Barcelona Post (Spain); as well as Oblast.Online (Ukraine). During the report launch, several think tanks rightly highlighted transparency, where they had achieved it. These included, CIDOB, EITI, ESPACIO, IISD, IDS, CPLR, TJN, and TI Georgia. In the near future, we plan to do a very targeted assessment, similar to the focus we previously published on the United Kingdom and Canada. Want to keep up to date with Transparify? Follow us on on Twitter, or sign up to our newsletter. Think tanks in the United States continue to grow, according to 2016 numbers that now are available. The expenditure of the top 21 think tanks in the United States grew by 6% and revenues by 5% between 2015 and 2016, significantly above inflation. While net assets stayed flat, employee numbers grew slightly, by 3%. The number of staff paid more than $100k increased by 10%, thus showing particularly strong growth. Within the group of think tanks, there were significant differences. In terms of expenditures, the Wilson Center (60%) grew particularly strongly, as did the Center for New American Security (CNAS, 27%), the American Enterprise Institute (AEI, 22%), the New America Foundation (19%), and the World Resources Institute (WRI, 16%). The German Marshall Fund (GMFUS) decreased its budget by 11%, and Brookings (-3%) and the Heritage Foundation (-2%) also decreased their expenditure. The numbers show that think tank funding is choppy. Not too much should be read into a year-on-year change, as funding often comes in lumps, for example through a targeted campaign or a large one-off gift. Yet long-term, the trends are interesting to follow. In 2016, CSIS had a 97% increase in funding, the Wilson Center 72%, CNAS 68%, New America 65%, and the WRI 37%. We are happy to note that New America and the World Resources Institute are 5-star transparent think tanks, too, and that CSIS has 4-star transparency. In terms of funding decreases, the Center for Budget and Policy Priorities (CBPP) had a 49% reduction, though this primarily is a result of a high yield in 2015, and CBPP is now broadly back to its previous funding levels. The same pattern applies to the AEI, with its 29% decrease, after a particularly successful year. The International Crisis Group however, experienced a substantive cut of -29%, down to $13m, and is at its lowest level of funding in more than ten years. One remarkable change is the increase in the number of staff paid more than $100.000. This has increased by 10% across the institutions, and together there are more than 1,700 people with that level of salary, reflecting that at least in some institutions, expertise is well remunerated. These are only some of the headline numbers. The spread sheet has much more detail, averages and medians, maximum and minimum, and is sortable. (Thanks to the Transparify team and to Johann Schmidt for assembling the numbers.) It should thus be of interest to anyone who wants to compare think tank numbers. The data broadly reflects the state of play for 2015 and 2016, as it is taken from IRS sheets for 2014 and 2015, with financial years ending across the year, for the institutions. One fascinating question is how think tank funding has evolved after the 2016 election. We will keep tracking budget data, and analyze future developments. The data sheet is here. If you find it useful, we are grateful for a quick note via Email or Twitter. The Transnational Institute’s mission is to strengthen international social movements with rigorous research, reliable information, sound analysis and constructive proposals that advance progressive, democratic policy change and common solutions to global problems. For more than 40 years, TNI has served as a unique nexus between social movements, engaged scholars, and policy makers. All the different strands of our work have an important element at their core: the element of trust. If our research is to be useful to the social movements we work with, they must know that we do not spearhead ulterior agendas. This is a trust we have cultivated with our partners for decades. TNI’s sense of integrity and commitment to the independence and intellectual rigor of the knowledge we produce are what draw the bright intellectual lights who work with us to our team. They know that a reverence for truth and intellectual probity are key to credibility, and thus to effective advocacy. Policy makers, even those who may not necessarily agree with us, have to rely on rigorous thought and analysis to make decisions that impact lives and shape the societies we live in. TNI holds firm to the notion that ideas have consequences. For instance, our research was used in support of the telecoms trade union in Cali, Colombia, and played a role in halting the planned privatization of the public telecoms company EMCALI. We have worked with rural communities in South Africa who are fighting the destruction of their communal lands in the name of development. Our research has also been used to fight back against free trade agreements that undermine human rights and democracy in South East Asia. The nature of our work, of creating bold and well researched radical critiques, has made us many friends. It has also, necessarily, ruffled the feathers of many, particularly those who find themselves the subjects of our examinations. It is no surprise then that transparency has always been important to us to keep the confidence of our allies and to deflect the barbs of those who would see our work diminished. In a context where established knowledge is under attack, where skepticism toward intellectual authority is growing, and where fake news is rampant, it is ever more important that think-tanks and knowledge producers not only profess their own transparency, but seek ways to independently show who funds their work, and for what purposes. It is TNI’s pleasure to be granted the maximum rating of five stars by Transparify. The rating shows that TNI is “highly transparent” about its funding sources, shows all its donors, and clearly identifies funding amounts and sources of funding for particular projects. It is external confirmation of the practices and due diligence we have always meticulously followed, and verifies that we operate according to the same ethics and rules that we consistently demand from others. We hope that in submitting to the Transparify process, we lend steam and momentum to wider-ranging transparency across the entire think tank sector, and ultimately, that we can contribute to collectively maintaining public trust in our work. Globalisation and new information technologies have changed the operating conditions for think tanks. Among the new challenges is the disconnect between governments and citizens – one of the reasons democracies we believed were firmly consolidated now appear weak. Think tanks today must be inclusive and commit to citizens as the catalysts for change, connect with governments, and contribute to solving the problems citizens cannot resolve by themselves. Fulfilling these objectives requires accountability to society and the institution's funders. An institution achieves prestige through the quality and independence of its output and transparency in its accounts. Both society and funders should know how the annual budget is spent and the details of its multiannual strategic plan. Specifically, the sources of its funding and how it is used to achieve the foundation's goals should be clear. Independence in research is entirely linked to transparency. A think tank must establish strategic goals for complying with transparency that go beyond even what is established by legal regulations. In addition to the legal requirements for transparency and accountability, the CIDOB Foundation has designed a strategy of publishing all information on its website in order to achieve the highest levels of public recognition and corporate prestige for its research, publication, activities and dissemination of opinion, as well as its transparency. The problem for think tanks today is not only competition in generating thought, it is access to funding. Reputation and prestige are key elements in securing this funding. So it should be restated that think tanks' most important challenges relate to the reputation and prestige associated with the quality of their research teams and their independence in strategic planning and decision-making. Think tanks are not consultancies. They do not compete among themselves to produce private goods to attract clients, but compete over reputation, producing public goods for the benefit of all. Some think tanks’ lack of transparency may negatively affect the public image and reputation of the sector. The positive effects of recognition make organisations that assess think tank transparency highly necessary: Transparify does this in the international field. CIDOB acknowledges and supports Transparify’s initiative of assessing the transparency of think tanks as a way of advancing good practices, prestige, and social recognition in the sector. After all, transparency is central to what think tanks, including CIDOB, do. Think tank financial transparency is becoming the norm across the globe: while in 2013 when Transparify carried out its baseline, 25 organizations were transparent, 92 are in 2018. This represents clear progress towards transparency, as highlighted in Transparify’s 2018 report released today. Yet, a majority of think tanks around the globe and even a majority of the think tanks we have ever rated (over 200) are not transparent. Transparify will continue to advocate for more transparency, to further increase levels of disclosure. What can others do? First, if you’re a journalist, ask the experts you interview where their funding comes from. If you can get an expert from a transparent institution, why quote one from an opaque, potentially biased think tank? You can use the list in this year’s report as a directory for finding think tanks that put an emphasis on integrity. Second, for think tanks that are not transparent, this is a good time to join the movement for more transparency. Nearly 100 institutions in 24 countries are transparent now. This includes some of the largest think tanks in the world like RAND Corporation and small teams like Georgia’s Institute for the Development of Freedom of Information. Why not joint them, now? Third, for donors, why not make think tanks provide a link to where they disclose who funds them? A simple question on applications, whether or not it affects funding decisions, can help encourage more think tanks to consider becoming financially transparent. These three simple changes are likely to improve and sustain the growth in think tank transparency we’ve seen over the last five years. To find out more about these changes, read How Has Think Tank Transparency Evolved in 2018. On Tuesday July 17th, Transparify will release its 2018 report, Transparency around the World. The report provides a listing of transparent think tanks across the globe, tracking the growth in transparency as a standard. Previous Transparify reports have been covered widely in the media, including by the New York Times, Reuters, Financial Times, and the Guardian. Background information on think tanks, transparency and lobbying can be found in our four annotated bibliographies. A summary on why many think tanks say that transparency is important to them is available here. New America, a high profile think tank located in Washington D.C., has received the Transparify Award for disclosing in detail who funds its work, with what amounts, and for what purposes. New America’s new disclosure format fully meets the 5-star gold standard for think tank transparency. The think tank’s innovative “Active Funding Transparency Table” provides exceptionally detailed funding data, including the names of all donors who gave $1,000 or more, and the term of each funding tranche received. US citizens want think tanks to be transparent about who their donors are, as a new study from We are Flint, a communications consultancy shows. This demand for transparency is particularly pronounced among those that know what think tanks do. The many quality think tanks that are transparent thus do respond to a broader public expectation, and not just to a niche demand from advocacy groups. The reason why this issue of transparency is important is because only a fifth of Americans trust think tanks, and a further 56% don't know whether to trust them or not, according to the survey, which had more than 2000 respondents. Transparency, by itself, does not ensure trust, but is a necessary step towards it. 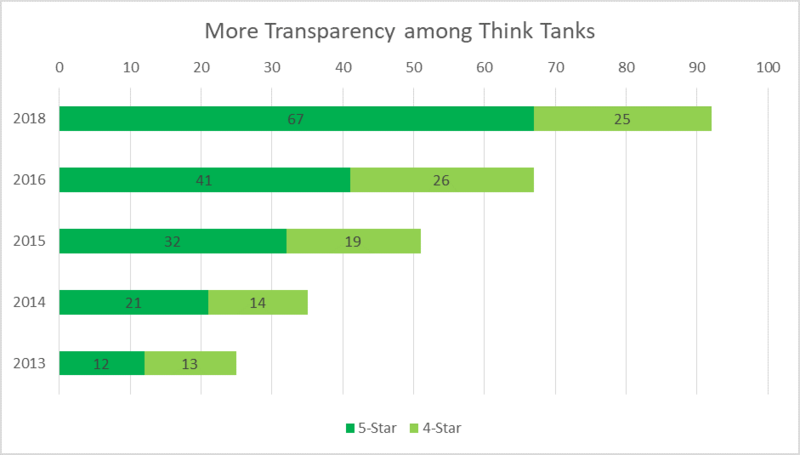 More educated people are keener on think tank transparency itself, as the chart below shows. More educated people also know more about think tanks. 57% of those with college degrees agree that they know what think tanks are. Only 20% of those without high school diploma agreed that they knew about think tanks. As We are Flint points out, more work needs to be done to communicate the work of think tanks to a broader audience. That finding, of course, lines up neatly with the kind of work that a communications consultancy does. The upside? We are Flint, unlike some hold-out opaque think tanks, is transparent about this. Transparify—an initiative that provides a global rating of the financial transparency of major think tanks and policy-relevant non-profit organizations—has just released its latest assessment. The International Institute for Sustainable Development (IISD) has earned the maximum rating of five stars for the third year in a row, meaning we are deemed “highly transparent” about our funding sources, and that IISD lists all its donors and clearly identifies funding amounts and sources of funding for particular projects. For IISD, this news could not come at a better time. Like other non-profit organizations, we are feeling the effects of the current, strained funding climate—with fewer potential sources of funding in our sphere of work (namely sustainable development) and much more intense competition for it. Think tanks play an important role in shaping public policy and public opinion in many countries. The research and evidence generated by organizations like IISD is unbiased, independent-minded and rigorous. Our goal is to provide knowledge that can impact decisions that affect us all. However, if some think tanks are less transparent than others about their motives and funding sources, a shadow of doubt is cast over the entire sector. Given this backdrop, a five-star transparency rating matters more than ever—indeed our financial sustainability rests on it. Transparent donor recognition, along with overall financial reporting, can be a crucial criterion for a funder to consider when determining which non-profit to fund. It can really set an organization apart. Existing and potential funders need to have quick and easy access to financial reporting, to see who else is funding our work, where their money is going, and what it is being spent on. Moreover, funders need to see how their support for our work leads to impact. They want to be able to attribute changes for the better to the dollars they have contributed. Openly listing all who choose to fund our work is, for us, a source of great pride. These organizations and individuals have selected us over other organizations and have placed their faith in us to use their funds wisely and responsibly. We are grateful for this and afford our funders due respect and recognition, whether in an annual report, or an easily accessible listing on our website. It is gratifying to receive this positive news as the calendar year draws to a close. We thank everyone who supported our work this year, as well as all our staff, and look forward to another five-star year in 2018. Which Canadian think tanks are transparent about who funds them? Which lag behind their peers in Canada? And how do Canada’s think tanks compare to those in other countries when it comes to funding transparency? Transparify’s newly released report, Think Tank Transparency in Canada: Lagging behind the US and UK reveals which Canadian policy institutions are transparent and which are not. In particular, it identifies four highly opaque think tanks that between them have sought to influence the policy making process in Canada through at least 216 appearances in front of parliamentary committees, and collectively generated nearly 60,000 media mentions. Overall, despite significant gains in transparency over the past year, Canadian think tanks still lag behind their peers in the United States and United Kingdom in terms of their funding disclosure. Previous Transparify reports have been covered widely in the media. Numerous think tanks and transparency organisations have welcomed our work. Background information on think tanks, transparency and lobbying, including many cases involving UK institutions, can be found in our four annotated bibliographies. Read the full report, Think Tank Transparency in Canada: Lagging behind the US and UK, and the accompanying press release. On Tuesday, 05 December 2017, Transparify will release its new report on the financial transparency of fourteen of Canada’s leading think tanks. The report provides ratings of these institutions’ funding transparency and tracks their progress over the past year. Previous Transparify reports have been covered widely in the media, including by the New York Times, Reuters, Financial Times, and the Guardian. Journalists can contact us via Twitter to request embargoed advance copies. Background information on think tanks, transparency and lobbying can be found in our four annotated bibliographies. To receive the report as soon as it is released, please sign up to our emailing list, or follow us on Twitter. Transparify is launching In the News, a new feature where we will rate the financial disclosure of a think tank that has recently generated media headlines. By responding to the media discussion of a think tank or its scholars, we hope to be able to further increase financial transparency in the policy research community and encourage financial disclosure by those who have substantial influence on public debates. Today, we take a look at the Middle East Institute (MEI), a U.S. think tank focusing on foreign policy and the Middle East that recently made headlines at The Intercept. Transparify decided to follow up by formally assessing MEI’s financial transparency. The rating followed Transparify’s established methodology. On September 11-12, two Transparify raters independently rated MEI’s financial transparency. They found that MEI did not provide systematic information on its website about funding sources, the purposes of donations, or the amounts donated. Transparify then approached MEI to seek clarification on its disclosure policies. A representative of MEI responded that after looking at Transparify’s rating criteria, they have prepared a five star disclosure that will be reviewed at their next board meeting before posting to their website. MEI shared its list of 2016 donors, with specific amounts of funding as well as the purpose of that funding. Once MEI has made that list publicly available through its website, it is likely to meet Transparify’s highest criteria for transparency. Transparify strongly welcomes MEI’s stated commitment to transparency, and will re-rate the institution as soon as it has placed the additional funding information online. We will publish the result of that rating on this blog. In addition to the new In the News feature, Transparify will continue to periodically publish national, sectoral and global transparency ratings of policy relevant nonprofits. We are currently finalizing a Canadian national think tank rating and will soon launch a rating of U.S. nonprofit media organizations. In addition, we have revisited websites of think tanks that lead with transparency, and will publish on this in the coming weeks.